The Princeton grade deflation policy of the last decade is now defunct (photo credit: Andreas Praefcke). Princeton grade deflation is finito. Back in August, we wrote about grade inflation at Princeton and how grade inflation remains a major problem at Princeton in spite of a grade deflation policy that went into effect at the university in the mid 2000’s. Well, there’s news coming out of Princeton on this subject this week. After a vote of the Princeton faculty, the policy of grade deflation that has been Princeton policy for the last ten years is now officially dead. 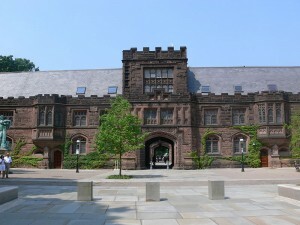 Now, each department at Princeton will have the freedom to chart the course of their own grading policies and this vote goes into effect at once. So what are average grades at Princeton these days? If you’re curious, grades in the A-range increased from 40-43% over the course of the last three years. But from 2001-2004, this same figure stood at 47%. This 2001-2004 period marked the years right before the grade deflation policy of the last decade was in effect. What do you think about Princeton ending its grade deflation policy? Do you agree with the Princeton faculty that this will lead to more students wanting to attend Princeton? Do you really think the grade deflation policy discouraged many students from applying to the university? We sure don’t! Princeton is Princeton. Their grading policy doubtfully discouraged too many applicants to one of America’s most prestigious universities.